Our farmers’ markets are in full swing now. During a normal week starting in mid to late spring and going through early fall, I often visit as many as three of them. Yes, yes, I know that is a lot but it is difficult to even limit myself to only three. I don’t just go to the markets to shop for the freshest and best local goods of the season. I also go for the conviviality. I never fail to see people I know, regardless of which market I am strolling through. Being connected with others in this way gives me a wonderful sense of community. Over the years I have made friends with many of the farmers and vendors. I enjoy greeting them as I go along the rows, admiring the fresh, locally grown products and home canned delicacies. Sometimes I bring the dog – there are some folks at the markets who are disappointed when I don’t. Our markets often feature special events such as demonstrations, lectures, book signings and on Saturdays there is always music. You can buy a coffee and a pastry from a number of our local bakers and sit and watch the crowd – a favorite activity of mine. I am having a hard time holding myself back these days. I want to buy some of everything being sold. So many unusual and special things: on Wednesday evening I bought Red Star Turnips, carrots and potatoes all of which had been pulled from the soil that morning. I also bought one waaaay expensive tomato that was probably one of the earliest local heirlooms of the season. (It is definitely time to break out the bacon and make some gourmet BLTs.) I have no idea what I will do with those turnips. The Farmer suggested I sprinkle them with olive oil and sea salt and roast them on the grill. Sounds good to me. My best purchase of the market on Wednesday were a gorgeous bunch of just-picked squash blossoms. Amazingly fresh and begging to be stuffed, I did not hesitate when I saw them. Now the truth be told, I have been a little remiss lately in my posting here. This is because I have been quite ill. If you knew what I have been through with pain and doctors and tests and surgery, you would understand. But this is not interesting stuff. Why I bring it up is that on Wednesday, at the market, I finally felt as if I was coming alive again and boy oh boy I suddenly got the urge to cook. That after a couple of long weeks of not only NOT wanting to cook but also not wanting to eat! So I am excited to get back in the kitchen, to return to my weekly rounds of fabulous farmers’ markets and to see many of my foodie friends. Spring peas: the stuff my dreams are made of? I have been dreaming of fresh peas (of the “shelling” or “English” variety) for more than a month now. I had started seeing restaurant menus featuring “spring” peas and this, I am sure, is what got me going. I put out an APB to my friends in the local slow food community. (We kinda look out for each other.) But nobody had any leads. I began showing up at our earliest farmers’ market, opened beginning every Wednesday starting on April 7th, right at the moment the vendors started selling – scouring the place for a cache of peas. Alas, none were to be had. After more than three weeks of purposefully pounding the pavement for peas, I was ready to give up. I just figured that all fresh peas in our world went to the restaurants and none of us peons were going to get any. I imagined trench coat cloaked vegetable purveyors furtively knocking on the back doors of the fanciest of eating establishments, quickly exchanging cash for peas. I envisioned a whole pea mafia to whom bribes were paid early on in the season to ensure that these rare jewels were safely delivered to these parlors of payola. Adding insult to injury, one of the web sites I like to visit, Food52, announced a contest asking people to enter their best spring pea recipes into the weekly competition. I wrote in and suggested that spring peas were impossible to come by and they announced that frozen peas could used as a sub for the real fresh thing. Ah ha…an admission that there was a pea cartel! Then, lo and behold, last Saturday I was standing in the middle of the produce department at my favorite local Whole Foods store when I turned to my husband and (I think in my normal tone of voice) said “I am just going to give up the search for fresh peas.” At that moment a miracle happened! A woman working the lettuce row turned to me and said “we have some fresh peas right there” pointing to a small stock of clear polystyrene boxes filled with the heretofore illusive vegetables. I say miracle because there was neither sign nor any other sort of indication of the existence of said peas and under no other circumstances would I have found them! Feeling guilty about buying 5 out of the 10 little boxes they had hidden there amongst the more common vegetables(I should have bought them all), I skulked out of the produce section with what I hoped would be my fill of the beautiful green pearls. Now that I realized my dream, I had to make some choices: what would be the best way to enjoy these sweet green things? Looking over my booty, I decided that I had enough for two meals worth of peas for the three of us (me, my husband and my wonderful, kind, sweet, darling, agreable, darling adolescent, step-monsterdaughter). I also knew that one meal had to feature just plain salted and buttered peas. So, that night I shelled about one cup of the fresh, succulent things and immediately before we sat down to our meal I tossed those little pretties into a small pan of boiling salted water. I left them there for not more than 100 seconds, knowing that fresh peas need very little heat to soften them up just the right amount. After draining off the boiling water I placed them in a little bowl with about a tablespoon of butter and a little bit of salt, stirred. At the table, I counted out the peas on the three dinner plates (ok, ok, that’s a lie but I would have liked to have done this because the damn things are so effing rare). Each of us savored every pea that went down our gullet, believe you me! The green giant has nothing on fresh peas – even when served perfectly plain and well-under cooked. The second go around was far less banal and no less delicious. Real, fresh, spring pea soup is NOTHING like Pea Soup Andersen’s, especially when subtly seasoned with preserved lemon and white truffle salt. Now I am not saying that Andersen’s is bad, its just that it is nothing special. It is made of those dried split peas that make a soup which is a grey-green, starchy, heavy, and, worst of all, ordinary. 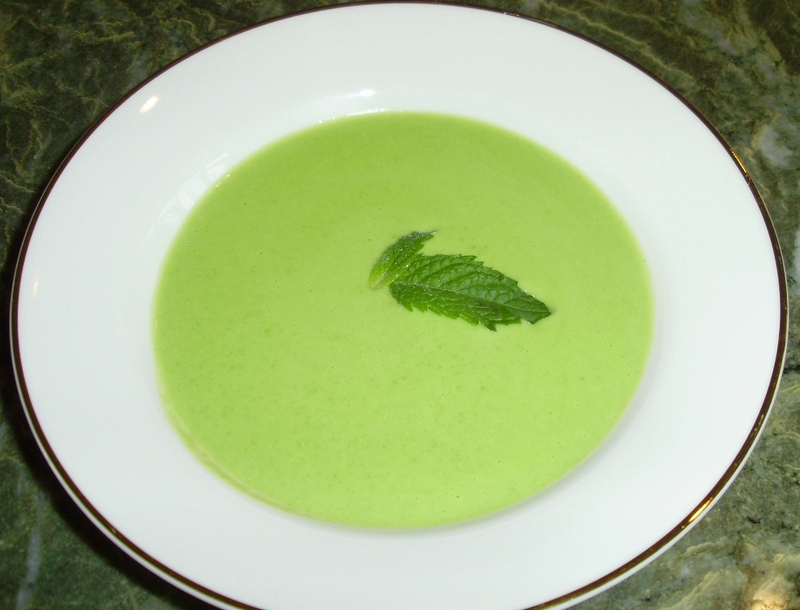 But Spring pea soup…that is another thing. After shelling out the rest of the peas, I had two cups to work with. This was just enough for a fine bowl of soup for each of us. I put the peas in a pot of boiling, salted water and set my timer for exactly 2 minutes. Then, I poured the peas into the colander and hit them with some nice cold water to cool them down quickly. There is nothing worse than overcooked peas – especially the rare, fresh ones. I placed the peas in the tall beaker that came with my immersion blender (remember my deserted island tool?) and added about a half of a cup of whole milk. I also added a couple of sprigs of fresh mint tops and a piece of rinsed and chopped preserved lemon peel. I ripped those peas to a puree with the blender and added more milk to get it to the consistency of mashed potatoes. This mixuture was blended long enough to get the puree to be velvety smooth. You could get a beautiful aroma off of the lemon and mint. I placed the puree back in a sauce pot, over a medium heat and thinned it (ladle, by ladle) with some of my nice rich hen stock. I brought the soup up to a nice warm temperature – but not so hot that you couldn’t spoon it right on your palate. This soup actually could have been consumed at room temperature. Just before serving, I finished and enriched the soup with about 3 tablespoons of mascarpone. I am going to dream about that soup until the next time I find some fresh spring peas!